If you are planning to Study in Canada you definitely need an information about University options available in Canada. There are so many world-class universities are present in Canada. Apart from America, UK, Australia, Canada is one of the leading Study Destination in the World. Having Top Class Universities in the world it attracts students from all over the world. So most of the international students enrolled into one of the courses offered by the Top Universities in Canada. To help the students planning to study in Canada, we have come up with the list of Best Universities in Canada, that are spread across the country. The University Rankings provided below help students and researchers to compare the quality of higher educational institutions and to identify the best universities worldwide. These University rankings vary depends on specific factors. Some rankings focus on research quality at a university while others focus more on teaching quality. Highly ranked universities receive top scores on indicators such as learning environment, program variety, influence on scientific papers, international focus, and more. While applying to the Universities in Canada students should not only rely on the top university rankings, they should also consider other relevant factors such as internship opportunities, the language of instruction or study location. All the Top Universities in Canada offers a wide range of Study Programs ranging from Undergraduate Majors to Doctoral Programs, including Masters Degree. And some universities in Canada also focuses on Advanced research facilities. So based on the Universiy facilities the QS Ranking System has developed the List of Top Universities in Canada. The Quacquarelli Symonds (QS) is an independent education and careers advice company that collect the data and prepare university rankings across the world. The QS University rankings are popular throughout the world. But getting admission in these Top Universities in Canada is not that easy, it is very competitive. you need to take some standardized tests like GRE/SAT/GMAT. Based on your obtained scores in these competitive Entrance Test the Universities will offer you admission into your preferred course. Through this Test Score, the universities analyze candidates ability to complete the course. Along with these Standardized tests to get admission in Canadian Universities, applicants should also take English language tests like TOEFL/IELTS/PTE to prove their efficiency English Language. Getting Admission in Best Universities in Canada is very Competitive. You must get a good GRE and TOEFL Score and should have good Academics also. Only the top scorers will get admission in Top Universities in Canada. There are 26 Canadian Universities are featured among the world’s best in the QS World University Rankings 2016-17. Among them, Three Universities are featured in the Worldwide Top 50, with further universities 10 universities are in the Top 300. The QS Ranking System is prepared based on the particular measurements such as 40% Academic peer review, 20% Citations per faculty, 20% Faculty to student ratio, 10% Recruiter review, and 10% International orientation. 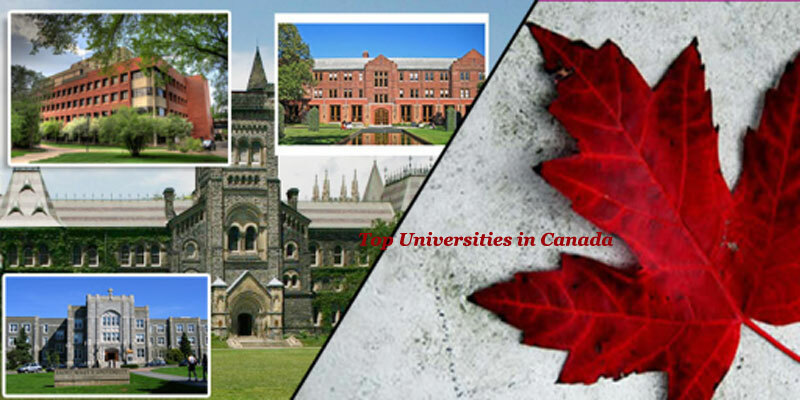 Here we have given the list of Top 10 Universities in Canada, which are treated as best universities among students.